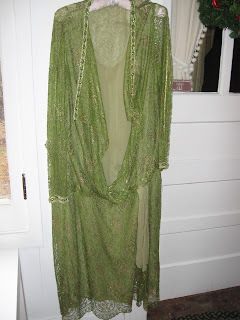 FOR YOUR CONSIDERATION IS AN EXQUISITE GENUINE VINTAGE ART DECO LACE DRESS FROM THE 1920s - A FINE, RARE TIMELESS TREASURE - A TRUE PIECE OF HISTORY. 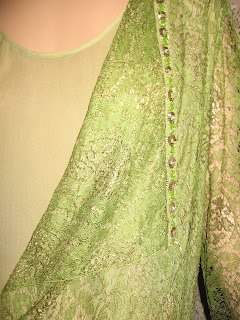 THE GREEN LACE IS SO GORGEOUS WITH THE METALLIC GOLD HIGHLIGHTS. THE DESIGN AT THE BOTTOM OF THE SKIRT AND FRONT DRAPE IS ESPECIALLY LOVELY. THE HEM IS SCALLOPED. 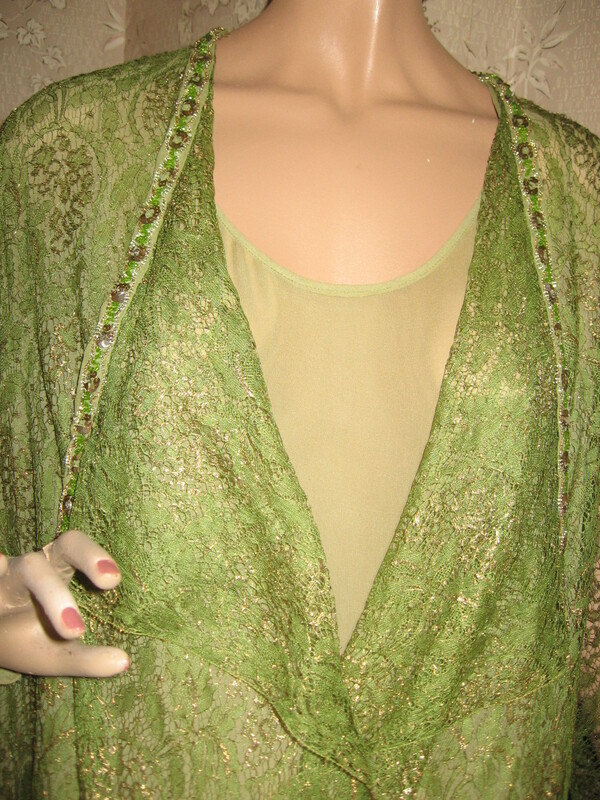 DRESS IS LINED WITH A LIGHT OLIVE GREEN CREPE WHICH IS EXPOSED IN THE FRONT CENTER WITH A LARGE LACE POINTED LAPEL DRAPED LOOSELY ON EITHER SIDE. 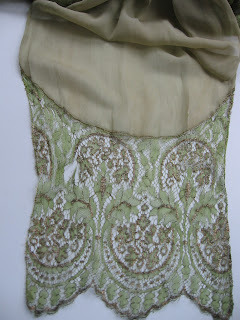 THE RIGHT SIDE OF THE LACE CROSSES OVER THE LEFT SIDE AT THE FRONT OF THE DROPPED WAIST. 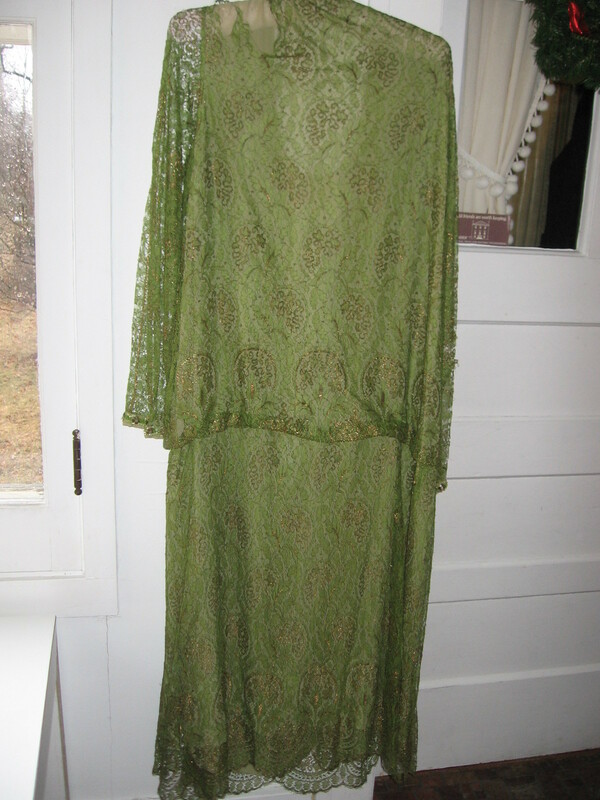 THE TOP OF THE DRESS IS LONGER THAN ITS LINING, SO THE LACE HANGS LOOSELY OVER THE WAIST. A CREPE AND LACE PANEL IS LOCATED ON THE LEFT FRONT, ATTACHED AT THE WAIST. 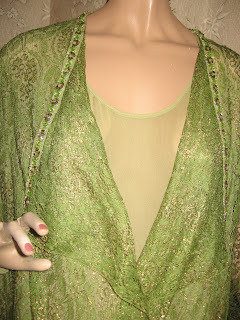 THE TOP OF THE DRESS, AROUND THE NECK AND DOWN THE FRONT, IS TRIMMED WITH GREEN CREPE WITH A BEAUTIFUL DESIGN OF WHAT APPEARS TO BE GOLD SEQUINNED FLOWERS WITH RHINESTONE CENTERS. MANY OF THE RHINESTONES ARE MISSING AND SEEN ONLY WHEN ONE LOOKS CLOSELY. THE FLOWERS ARE SEPARATED BY GREEN SEQUINED LEAVES. TINY ROUND GOLD BEADS IN A SCALLOPED DESIGN OUTLINE THE FLOWERS ON BOTH SIDES. THIS TRIM IS ALSO ON THE BOTTOM OF THE LONG SLEEVES. THERE IS A SNAP CLOSURE AT THE WRIST SEAM. 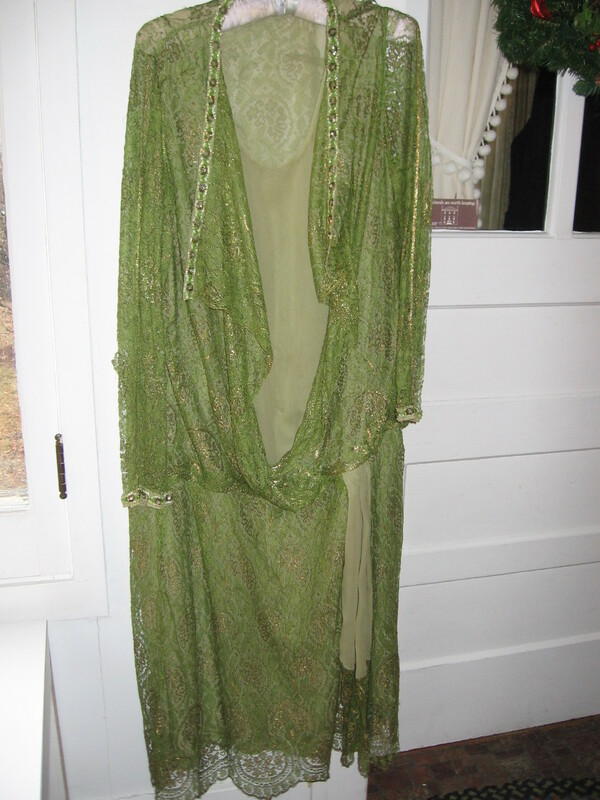 THIS IS A TRUE MUST HAVE AND A PERFECT ADDITION TO YOUR VINTAGE CLOTHING COLLECTION. THE FACT THAT THIS DRESS HAS SURVIVED ALL THESE YEARS IS INCREDIBLE, DESPITE ITS AGE APPROPRIATE ISSUES. I MEASURED THE DRESS FLAT AND SHOULDER TO SHOULDER MEASURES 15 1/2 INCHES. ON THE LINING, UNDERARM TO UNDERARM MEASURES 23 INCHES - THE DROPPED WAIST MEASURES 25 INCHES. SLEEVES ARE 25 INCHES LONG. THE CIRCUMFERENCE OF THE UPPER ARM MEASURES 15 INCHES. I MEASURED THE DRESS FROM THE BACK SHOULDER SEAM TO THE BOTTOM OF THE HEM, AND DRESS IS 55 INCES LONG. IT MEASURED 26 1/2 INCHES FROM THE SHOULDER SEAM TO THE DROPPED WAIST. I THINK THAT IT IS POSSIBLE TO RESTORE THIS BEAUTIFULLY DESIGNED HISTORIC DRESS WITH A LITTLE TLC, AND IT IS PERFECT FOR THE CREATIVE SEAMSTRESS. HOWEVER, I WILL LEAVE THIS DECISION UP TO THE BUYER'S DISCRETION. IF IT IS NOT RESTORED, IT IS STILL A BEAUTIFUL GARMENT FOR DISPLAY, PATTERN OR STUDY - A BEAUTIFUL HISTORICAL ARTIFACT FROM A BYE GONE ERA. THIS DELICATE LACE HAS TEARS AT THE UPPER BACK, ON BOTH SIDES BELOW THE SHOULDER SEAM, ON THE RIGHT ELBOW, UNDER THE LEFT ARMPIT, ABOVE THE WAIST ON THE RIGHT SIDE AND ONE IS ON THE PANEL LOCATED AT THE LEFT FRONT. THERE MAY BE SOME SMALLER HOLES ELSEWHERE IN THE LACE, BUT THEY ARE NOT AS NOTICEABLE, AS I HAVEN'T BEEN ABLE TO FIND THEM. I HAVE MENTIONED THE LARGER ONES. BENEATH THE TORN LACE ON THE RIGHT SHOULDER, THERE IS A SMALL HOLE ON THE CREPE LINING. THERE ARE ALSO 3 HOLES ON THE BOTTOM OF THE CREPE PANEL. THESE COULD BE REMOVED BY A GOOD SEAMSTRESS BY RAISING THE LACE HIGHER TO COVER THIS AREA . THE CREPE AT THE FRONT CENTER AND THE CREPE LINING OF THE SKIRT APPEAR TO BE IN GOOD CONDITION. THE DRESS HAS A SLIGHT VINTAGE ODOR AS SOME VINTAGE CLOTHING SOMETIMES DOES. I HAVE TAKEN PHOTOS OF THE LARGER ISSUES FOR YOU TO SEE. I understand you are excited about the dress you have to offer. It is lovely. However, writing in all caps is considered poor 'netiquette (Internet etiquette) and suggest shouting. Are you yelling at us, your poor would-be shoppers? Please, for the sake of our eyes, turn off CAPS LOCK and permanently disable it before I have to do it for you. As for the dress, I just liked that it was in the same color family as the previous dresses/jackets I posted. Must have been a popular shade!